After catching 52 passes for 821 yards and two touchdowns in 12 games with the Chicago Bears in 2016, Jeffery signed a one-year deal worth $14 million with the Philadelphia Eagles. 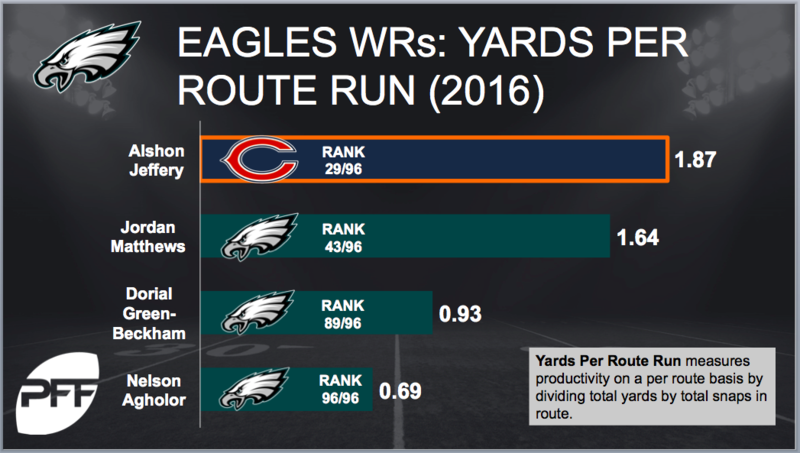 Alshon, who averaged over 1.87 yards-per-route-run in ’16, immediately provides a huge upgrade to a Philly receiving corps that had 26 drops and averaged just under 1.08 yards per route ran last season. With slot-receiver Jordan Matthews and tight end Zach Ertz drawing coverage over the middle, look for the 6’3″ Jeffery to have plenty of man-to-man opportunities on the outside. While injuries have been a concern for Jeffrey throughout his career, he enters this year completely healthy, and according to Eagles’ wide receiver coach Mike Groh, Alshon looks the best he has since 2013. This is great news for Philly fans and second-year QB Carson Wentz, who has the arm strength to excel at throwing the deep ball. 2017 Predication: 77 receptions for 1,125 yards and seven touchdowns. Having signed a one-year deal for $8 million with the Washington Redskins this offseason, Terelle Pryor will step onto the field as the clear number one target on the outside for quarterback Kirk Cousins. DeSean Jackson and Pierre Garcon are gone, along with their combined 135 receptions, 2,035 yards and 7 touchdowns from 2016. The Redskins still have tight end Jordan Reed and slot receiver Jamison Crowder, but no other experienced receiver returns on the outside. With five different Cleveland Brown quarterbacks throwing him the ball in 2016, Pryor still managed to post 77 receptions for 1,007 yards and four touchdowns. Now he gets to catch passes from Kirk Cousins and his career 93.6 QB rating. Terrelle’s own past as a quarterback is already helping him acclimate to his new signal-caller Cousins, who has said he wants to get the ball to Pryor as much as possible. A freak athlete, Pryor will look to replace Jackson’s downfield production for the ‘Skins and bring more consistency on a week to week basis than he did in Cleveland. 2017 prediction: 72 catches for 1,065 yards and six touchdowns. Despite turning 31 this December, DeSean Jackson is still a threat to put up big numbers. With the Washington Redskins in 2016, Jackson averaged over 17.9 yards per catch on 59 receptions while scoring four touchdowns. DeSean ranked third in the NFL with an average of 11.29 yards per target and had 32 targets 20 yards or more down the field and eclipsed the century mark in receiving yards in four of the Reskins’ final six games. This offseason, Jackson parlayed his fifth career-1,000 yard season into a three-year deal worth $33.5 million with the Tampa Bay Buccaneers. In Tampa, Jackson will team with All-Pro receiver Mike Evans to provide QB Jameis Winston two of the most dangerous deep-threats in the NFL. With Evans drawing double coverage on one side and the newly drafted tight end OJ Howard combining with fellow tight end Cameron Brate to eat up coverage inside, DeSean will see plenty of single-coverage down the field, which is great for Jameis Winston. The second-year quarterback led the NFL with 67.8 percent of his passing yards coming through the air, rather than after the catch and will look to push it downfield to Jackson early and often. DeSean does come with some risk for fantasy owners however, as he has been a little boom-or-bust as he tends to overly rely on the deep-ball to put up fantasy points. 2017 prediction: 51 receptions for 918 yards and seven touchdowns. On March 16, 2017 Latavius Murray inked a three-year deal with the Minnesota Vikings for $15 million. The signing signaled the end of the Adrian Peterson era in Minnesota and the start of a new, passing-centric offense. Looking to ride on the throwing arm of Sam Bradford and his NFL-record 71.6 completion percentage, the Vikings went out and signed a three-down back who excels in short-yardage situations and in pass-protection. In 2016 with the Oakland Raiders, Murray rushed for 788 yards and 12 touchdowns, while earning the fourth-highest grade among NFL running backs for pass-protection by Pro Football Focus. Last year saw Minnesota struggle mightily in short-yardage rushing situations, converting only 13 of 25 runs on third or fourth down with three yards to go while averaging just 1.36 yards on those 25 carries. Enter Latavius Murray, who is listed at 6’3″ and 230 pounds and converted 13 of 18 third or fourth down carries with three or less yards to go while averaging over 4.9 yards on those same carries. There is no doubt Murray will be a much more physical presence for the Vikings run game, and expect him to see plenty of touches until rookie Dalvin Cook gets up to speed. Even then, expect Murray to see a large share of first and second down touches as well as the majority of goal-line carries. 2017 prediction: 180 carries for 720 yards and nine touchdowns with 38 receptions for 266 yards and one TD. Despite his worst season in the last decade, where he totaled just 59 catches for 788 yards and three touchdowns with the Jets, Brandon Marshall signed with the New York Giants on a two-year deal worth $12 million. The good news for the Giants? The 6’4″, 230 pound wide receiver steps into the Giants offense and instantly improves the physicality of their receiving corps and creates a redzone-matchup problem the Giants haven’t had in years. The good news for Brandon? Instead of the Jets’ QBs throwing to him, he now has two-time Super Bowl winner Eli Manning looking his way. Marshall will also get to line up opposite of the dynamic Odell Beckham Jr., who will draw plenty of double-teams. While Brandon struggled mightily last year, catching only 48.8 percent of his 121 targets, a lot of that could be blamed on the overall dysfunction occurring in the Jets’ backfield and organization itself rather than a decline in the 33-year old’s talents. You just have to look at last year’s showdown with Richard Sherman and the Seattle Seahawks to see that Marshall still has what it takes to make an impact. Matched-up one on one against Richard Sherman almost the entire game, Marshall caught four passes for 89 yards and a TD, one of only two touchdowns Sherman allowed all season. Marshall will bring an added dimension to the Giants with his ability to block in the run game, and should see plenty of targets as New Yorks’ true #2 receiver, especially in the redzone when teams look to take away Beckham Jr. 2017 prediction: 65 receptions for 910 yards and eight touchdowns. Eddy Lacy, Seattle Seahawks: Lacy will fight for touches in a crowded, yet injury-prone backfield. Pierre Garcon, San Francisco 49ers: Garcon provides San Fran with a true #1 receiver. Adrian Peterson, New Orleans Saints: Peterson will team with Mark Ingram to give Drew Brees and co. an added dimension to their already dangerous offense. LeGarrette Blount, Philadelphia Eagles: Blount gives Philly the true short-yardage and goal-line back they’ve been sorely missing. Martellus Bennett, Green Bay Packers: Bennett gives Aaron Rodgers a legitimate threat down the middle of the field and his blocking ability will provide a boost to Green Bay’s running game. *These rankings do not take into account the Patriots’ Brandin Cooks or the Raiders’ Marshawn Lynch, who were acquired via trade.